Regal Bulk Table Grind Black Pepper - 25 lb. Regal 25 lb. 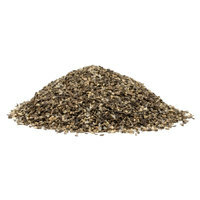 bulk table grind black pepper is the perfect seasoning and garnishing choice for your foodservice business. A 25 lb. bag of Regal bulk table grind black pepper is an excellent complement to salt and a must-have seasoning that delivers robust flavor to every dish. 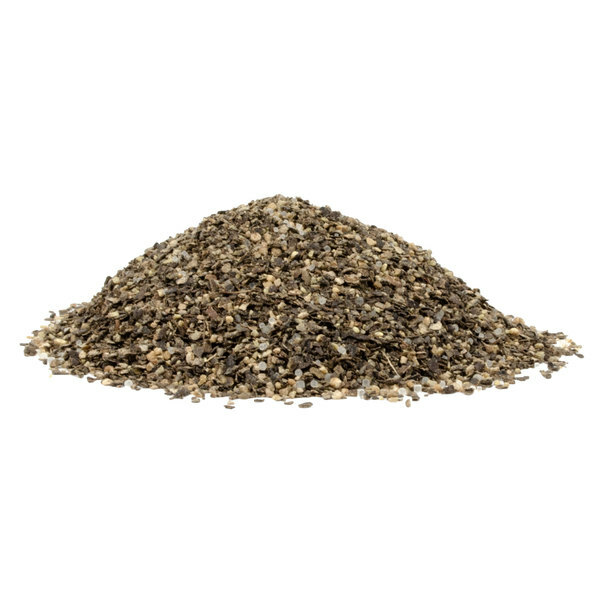 Featuring a strong taste, table grind black pepper is highly aromatic, flavorful, and features a dark color that can add to the appearance of your meals. Commonly used with meats, seafood, poultry, soups, and stews, this black pepper is sure to be a hit with customers. Whether you run a restaurant, hotel, diner, or cafeteria, table grind black pepper is the perfect addition to your business. "This is not only a great price, but also great quality. It comes in big plastic bag, easy to open and store back what we are not using at the moment. I will definitely be buying this product again"
This 25 lb. bulk bag of table grind black pepper is a cost-efficient option for high-volume kitchens and can easily be portioned into smaller quantities. Pepper is an incredibly versatile ingredient and a staple of every pantry. Perfect for garnishing or seasoning, table grind black pepper is a must-have in any commercial kitchen. Regal Herbs and Spices are a smart addition to any kitchen. This handy 25 lb. bag satisfies all of your cooking and seasoning needs. Be sure to check out our quantity discounts for even better wholesale savings! This table grind pepper has a mesh size of 25 and is the type of pepper you'll find in shakers on restaurant and diner tabletops. The pepper flakes are slightly larger than fine grind black pepper, yet not quite as noticeable as coarse grind black pepper. 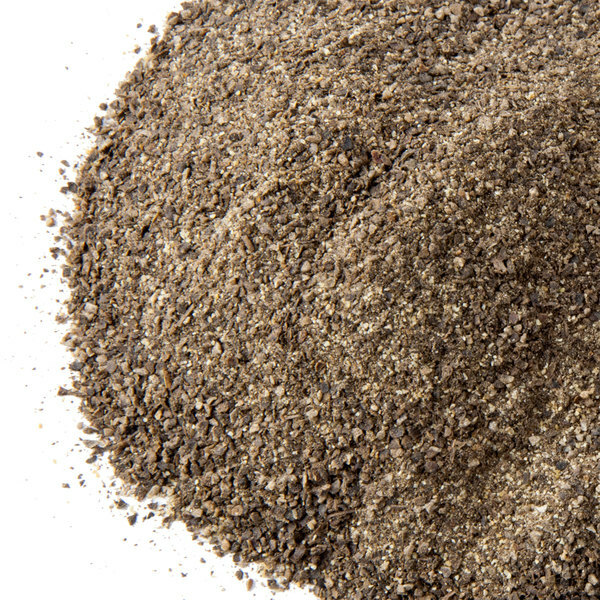 Item #: 102707756 Regal Bulk Table Grind Black Pepper - 25 lb. 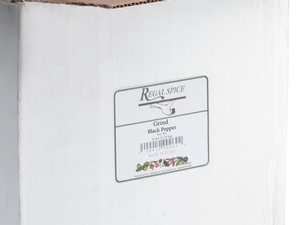 Item #: 10200125 Regal Bulk Ground White Pepper - 25 lb. 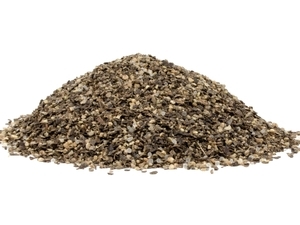 Overall User Rating: Regal Bulk Table Grind Black Pepper - 25 lb. This pepper is amazingly priced but you get what you pay for. This black pepper is very powdery so you have to be careful with your measurements what worked fine before maybe too much pepper with this one. Also when you pour it leaves peppery cloud. It was a GREAT price for good quality black pepper. I use it for sauce mixes. Glad it shipped quickly. I would recommend getting a smaller container so you can refill. Comes loose in a big plastic bag. Another spice that I purchase exclusively at Webstaurant. Price and quality can’t be beat by any other retailer. The smell is intoxicating and you want to smell it again and again. Don’t hesitate and just order! I warn you that you’ll end up sneezing. Totally amazing product. Buying in bulk always says the consumer a ton of money but, this is still less expensive than other brands. This is a great tasting pepper and I would recommend it. Black Pepper is one of my favorite spices and this Regal Brand stands tall as far as pungency of flavor and aroma. A great black pepper to use for any application. I couldn't be any happier. My old supplier was sold and the new company is not good at all. Glad I found Webstaurant. Their prices are great and the product is exactly what it says. Buying this pepper in bulk is the only way to go.. Price is right, and the product is amazing quality. I buy this by the tons..
Buying pepper in bulk from WebstaurantStore is a smart buy and will save you some money, especially if you have PLUS and get free shipping. The pepper is good quality. The only negative part is that some of the photos they show appear to be a different grind that isn't so powdery and small. So be aware that this is almost a fine grind. Love the regal bulk table black pepper and is great for large usage. A great pepper for seasoning our dishes and great for price for bulk buy. 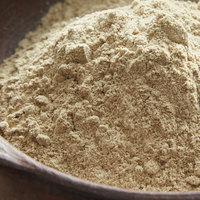 A great bulk buy for grind black pepper that is great for refilling our table grinders. The pepper is bold and flavorful and a great color. 4 stars! We love the consistent color, aroma and taste! The quality and price is good too. Regal is a trusted brand. They seem to always deliver! Great Value, Great Product! I would Highly recommend Regal spices. Quantity verses cost has a great benefit! If you use Ground pepper I would recommend looking into this product and switching over. We use it in place of Sysco brand. You would not believe the cost savings!!! I love being able to buy my spices is such large bulk boxes that helps save us money. The bulk table grind black pepper is great for our cooking as well as refiling the shakers on the tables. Love this bulk size of table grind black pepper! Great quality and taste! We use lots of pepper at my house so this product goes fast. Love being able to buy it in this quantity. This is the best value for ground black pepper when you break it out by the ounce. None of the other competitors come anywhere close. This pepper is full of flavor and has a great texture. I love using this in dry rubs, sauces, dressings, or anywhere I want to be able to clearly see pepper. The basic spices to have are white salt and black pepper. This black pepper spice has good flavor. Regal foods is a great brand for quality over cost. The Regal brand table grind black pepper is a great value, both in price and quality. The grind is perfect for seasoning blends and the product is always clean. If you use a lot of black pepper this is the way to go buy it here and save a lot of money what a great product it ships very quickly . This is a great deal. We are happy with the product as well as the pricing. Our other supplier was charging a crazy price. This s a real budget helper. The Regal Ground Pepper is a quality product. Nothing special; just quality table pepper. 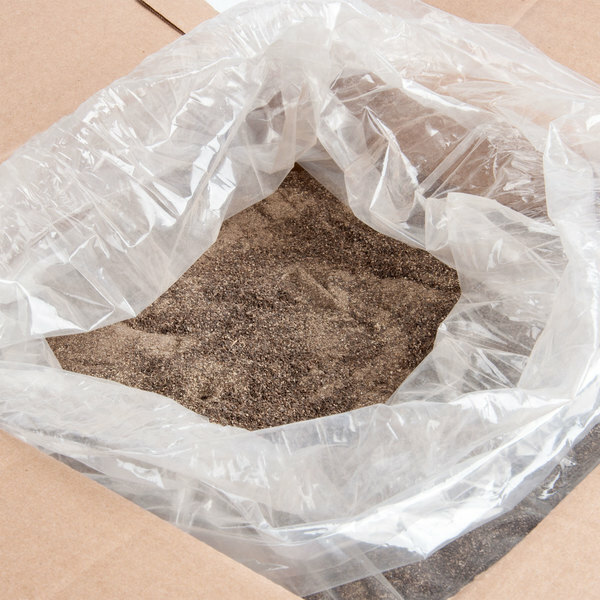 The twenty five pound packaging is essentially a bag of pepper within a box, so buyers should prepare to repackage the bulk into individual containers. It's a bit more work, but worth the price. This pepper is a great price. Cheaper then what you would find from a major supplier. The grind on this pepper is also much finer then normal table to pepper. Purchased this large bulk of black pepper and it is perfect for serving in our restaruant. I also use it to make our own personal seasoning. I only rated this a 4 because of the poor box it was shipped in! Great price on a good product. This was the cheapest place to buy it and I am more than satisfied with it. I will order much more in the future. Great price on the bulk black pepper! It is exactly what we used before ordering from WEBStaurant and we saved over $30 by ordering here. Excellent product!